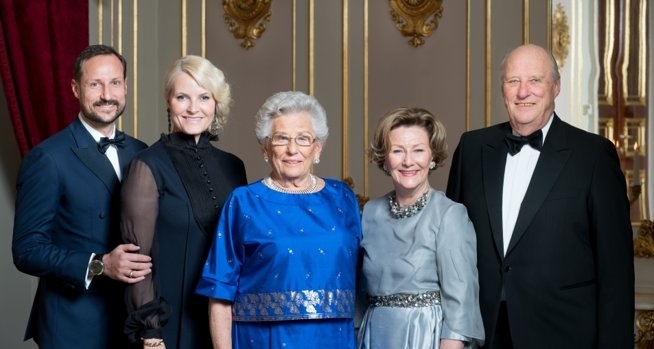 Tonight, Princess Astrid, is attending the dinner celebrating the centenary of the Norwegian Women and Family Association at the Grand Hotel, September 19, 2015. H.H.Princess Astrid attends the switching on of the Christmas tree in Trafalgar Square on December 3rd. On Saturday, August 20, 2016, Princess Astrid attended the centenary of the Student Home for Young Girls. I like at the second photo the portrait of her mother!! Thanks for the pictures, polyesco! Princess Astrid is quite a character. She has (according to King Harald) a strong temperament and has been and is a strict big sister, but always someone you can ask for advice. She still gives interviews to newspapers (twice in 2016), and was then on the front pages. i love the photo with the dog i think it's more formal and regal it's just my opinion but it would had been much better if the sitting photo was the one with the queen alexandra turquoise tiara and the standing photo with the portrait of her mother would had looked better with the dog . Sounds like the king is quite close to his older sister. I like the second picture in evening dress , Sash beween her Parents Paintings. The Pictures of Princess Mârtha do me think to our beloved Queen Astrid, she was Queen , her Sister died before being Queen. 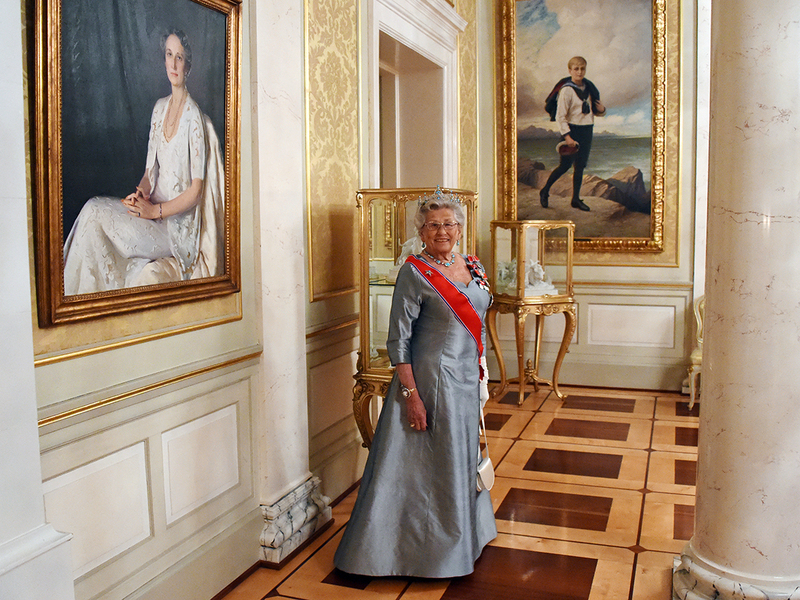 What lovely photographs of Princess Astrid on the eve of her 85th birthday! They are very close and see each other several times each month (often just the two alone). I would not characterize the princess as a warm person (and she was, according to her children a strict mother), but she is a very funny lady. The Princess is turning 85 Sunday, but King Harald and Queen Sonja hosted a dinner on Friday. ''The King and Queen held a Birthday-Celebration for Princess Astrid, Mrs Ferner at the palace'', communications manager Marianne Hagen said. In addition to the royal couple and Princess Astrid with family, Princess Ragnhild's family, the Crown Prince family and close friends attended the dinner. The princess will celebrate privately on Sunday. Princess Astrid Maud Ingeborg was born in 1932, as the second oldest child of King Olav and Crown Princess Märtha. She grew up at Skaugum in Asker, but fled with her family when the Germans invaded Norway on April 9, 1940. The story about the escape was in 2016 immortalized in the Norwegian film "King no." Head writers Harald Rosenløw Eeg and Jan Trygve Røyneland spent much time figuring out how the royals were, and they had several meetings with Princess Astrid, who told how she remembered both people and events. ''We were in contact with Princess Astrid, who is the family's memory'', Rosenløw Eeg, screenwriter said. In September last year, Princess Astrid attended together with among others the King, Queen, Crown Prince and Crown Princess as the film was shown to an audience of thousands in the Palace Park. When Princess Astrid was born, it was clear that neither she nor Princess Ragnhild could ever take the throne. Nonetheless, the princess duties included being First Lady after Crown Princess Märtha died in 1954. The tasks as a Norwegian princess and a representative of the royal family become bigger when her father, King Olav, took the throne in 1957. She followed him to the consecration ceremony in Trondheim and at travels at home and abroad. In 1960, she was engaged to Johan Martin Ferner, which created public debate since he was a divorced man. The two married in 1961. She continued to represent the royal family, while she got five children. Johan Ferner died on January 24 2015, 87 years old. ''The fact that she got married to Johan Ferner, was her great happiness. She has often emphasized that her mother, Crown Princess Märtha, was very fond of him, said TV2 royal expert Kjell Arne Totland to NTB in 2015. In 1968, Crown Prince Harald also finally married Sonja Haraldsen. With a Crown Princess in the country, Princess Astrid got less to do in public. The King's second oldest sister has always continued to be a support for him through periods of illness, she has represented the royal house and Norway. She has been involved in working with children and young people who, like her, have dyslexia. She is chairman of Crown Princess Märtha's Memorial Fund. In gratitude for the efforts she has made for Norway, both as first lady and after that, the government decided in 2002 to give the princess a honorary pension from the state. Have people here seen the picture (in my above post) from the dinner at the palace last night, where she stands with the King, Queen, Crown Prince and Crown Princess? The Royal Family's "Grand Old Lady" has birthday! On Sunday, King Harald's sister Princess Astrid is turning 85 - and celebrates the day privately with her immediate family - children, in-law and grandchildren. But already on Friday night, the royal couple invited to a great birthday dinner at the Royal Palace in honor of the princess. Astrid Maud Ingeborg, Princess of Norway, was born at Skaugum as the middle of then Crown Prince Olav and Crown Princess Märtha's three children - two years after her sister Ragnhild and five years before the "little brother Hajan," as the two sisters called him. And what people don't think of is that Astrid after her mother's death in 1954 as the only adult woman in the royal family here at home, for many years was Norway's royal first lady. Both for her grandfather King Haakon and her father King Olav. This lasted until then Crown Prince Harald married in 1968. Despite the fact that Astrid herself had started a family - and received five children. The now 85 year old princess continues to represent the royal family unabated - both alone and together with her brother and his family. And this despite the fact that she has had some health problems over the years. In younger days, she was constantly plagued with so-called rheumatic fever. And because of a loose tarsals, she has always had a tendency to "step over" - and therefore a number of times appeared on crutches at official occasions. But after Astrid a few years ago began using acupuncture, she has told that she has far better health. I first saw Astrid carry the corset at the big garden party in the Queen Park in Oslo on September 1. There she sat in the front row - between King Harald and Queen Sonja, who were both concerned about her welfare. We saw the same touching concern for the princess at the premiere of the film "The King's no" in the northern part of the palace park a few weeks later. And despite the back pain, Astrid attended the autumn's big gala parties at the palace - with the bracing corset clearly visible outside her exquisite evening gowns. I think it is very admirable that Princess Astrid despite her advanced age and her ailments, in an so unprecedented way, shows her sense of duty and her desire to help and support her brother in his important work. I congratulate hereby the princess with the day - and hope that she still for many years with her smile and her style will throw joy and gloss over events at the palace! The Princess has given an interview to NRK Dagsrevyen (Norway's largest news program), both the King and Crown Prince talked about her. I don't have the time now, but I'm going to write a post about it later tonight or tomorrow. Thank your ROYAL NORWAY, your information is very much appreciated! The photos are beautiful, it's nice that we get a picture of Princess Astrid with the King and Queen and the CP Couple. The translation is quite bad, I'm waiting for ROYAL NORWAY's summary But there are great pictures of Princess Astrid. You're very welcome, fairy tale! Google Translations is always bad, but this article by NRK royal correspondent Kristi Marie Skrede is written in Nynorsk (New Norwegian) and is therefore even worse to translate. It's too boring to be a pensioner, says Princess Astrid, which turn 85 on Sunday. When she was widowed two years ago, she traveled at first to Svalbard and drove scooter. Then she filled the calendar with engagements for the royal house. There is a clear command which go through the ministerial lounge at the castle. Little Pepita flounder a bit in the smooth couch before she obeys her mistress. After seven years with Princess Astrid, the company dog of breed Japanese chin has learned that there is no way around. 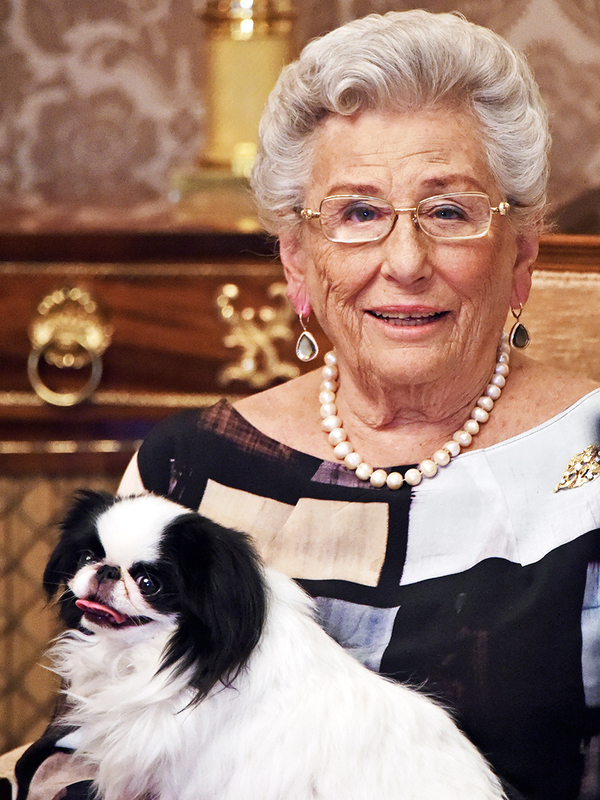 Princess Astrid, Mrs Ferner turn 85 this weekend. She was celebrated at the Palace Friday night. King Harald and Queen Sonja were hosting the dinner. Family, friends and close associates were guests. ''We have a very close relationship. She is boundlessly loyal. It has always been a hallmark at her'', King Harald said. His Majesty says yes right away when NRK asks if he will tell about his big sister and her importance to the Norwegian royal family. So does Crown Prince Haakon. ''First and foremost, she is an aunt we are very fond of and who's always there. She contributes tirelessly, who is a tradition in our family. As such, she has a lot of King Olav in her, the crown prince said. On two occasions, the life turned dramatically for Princess Astrid. Both times, she has come forward with her own method. Aged 22, she lost her mother, Crown Princess Märtha. The royal family was left with an aging King Haakon and a grieving Crown Prince Olav. The young princess, who was not trained for a big public role, was suddenly Norway's first lady. Now it was her task to be hostess for government leaders and to represent Norway at home and abroad. ''I almost came right out of college. I did not know what this was. So I was probably a bit hesitant at first. But then you become used to it and get a little help here and there. And it must go. It must go'', she says, while she is looking down. It's the same today, 63 years after. That was the advice from her mother's old lady-in-waiting, which gave Princess Astrid courage to embark on the tasks. ''Be yourself! Otherwise it will be false. And it was good advice. Then I could relax more''. ''I believe that to suddenly become first lady awakened her. She realized that she was wanted'', King Harald said. Princess Astrid is still the one who never says no when the monarchy need her. The life turned again when her husband Johan Ferner passed away two years ago. Princess Astrid went forward with her own method this time too. First she traveled to Svalbard and drove scooter along with her sons. An experience she later described as terribly fun in an interview with the magazine Allers. ''When we drove snowmobiles, the speed was so low that I had to ask them to get the speed up'', she said to Allers. Then she filled the calendar with engagements for the royal house. The princess has twelve patronages and shows up at events as often she can. In addition, she is always pressent at State visits and big occasions. The work become particularly important when she losed her husband. ''I sit alone at home and then it's nice to be asked out. If I can do a job, then it's extra nice. Everyone likes to feel that they still have something to give'', she says. ''But it's so boring! No, there must be something to do. It keeps one up and about'', she says in her own strict way. ''I can assure you that my sister is very strict. If there is something she does not think is right, then we'll clear message'', King Harald said. ''This applies to the king too? ''Oh yes. I'm the little brother, I, you know'', says King Harald, laughing. Crown Prince describes his aunt Astrid in the same way. - She's like an encyclopedia for us. We can ask her about anything, she remembers incredibly well. She has strong opinions about how things were before and how it should be now, he says and smiles. Princess Astrid is laughing when we refer what is said about her. ''No, I'm not afraid to speak out. I am not''. But she will not say what she has spoken out about, she tries to take criticism in private. On a dark and rainy autumn evening, Princess Astrid saw the film about her own dramatic escape in 1940 at the outdoor cinema in the palace park. "The King's no" give a true picture of what happened, according to the princess. She was an advisor to the filmmaker Erik Poppe. ''I think he, who played Grandpa was very good'', she says. Some scenes are like watching King Haakon just as his granddaughter remembers him. In the ministerial lounge at the Palace, the Princess sits under the large painting of King Olav's consecrations ceremony in Nidaros Cathedral in 1958. Closest to the new king in the painting is the young first lady in a blue dress. ''Historical. I remember it as very historic'', she says. Little Pepita has settled in the lap of his owner and has found the calm there. The Princess has had dogs since she was two. Now it is Pepita who keeps her company and get her out on daily walks. The little brother, the king, is turning 80. Neither he or his big sister has plans to quit the royal work. ''I am born to it. And then I have to carry it until the day it ends. It is clear'', she says. ''It is not in her nature to give up, so she's not going to do that. And thats make me very happy, said King Harald. Princess Astrid is not looking like having her 85th birthday today. She looks so young. Today, Sunday 12 February, is the 85th anniversary of Her Highness Princess Astrid, Mrs Ferner. Their Majesties The King and Queen gave a dinner in honour of the Princess at the Royal Palace Friday. We invite everybody to send their greetings to Her Highness via this congratulatory message register. It will remain open for new entries until 09:00 tomorrow morning. All the greetings will be presented to The Princess. The Princess has in addition to the NRK interview, also given a very personal interview to VG (Norway's largest newspaper).